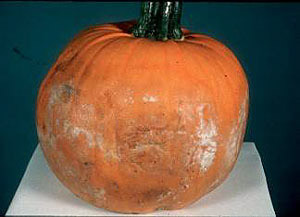 This fungal disease affects all cucurbits, especially winter squash and pumpkins. It is most common in humid areas of North America. Fruit in contact with soil are especially susceptible. The infection begins as a watersoaked spot or depression, later producing spreading white mold. Rotten spots grow rapidly, and fruit may eventually collapse. The disease may set in after harvest. The fungus survives in soil for at least two years. Use a minimum 2-year crop rotation excluding other host plants (eggplant, pepper, tomato). Plant only on well-drained soil or raised beds. Elevate fruit off soil surface.